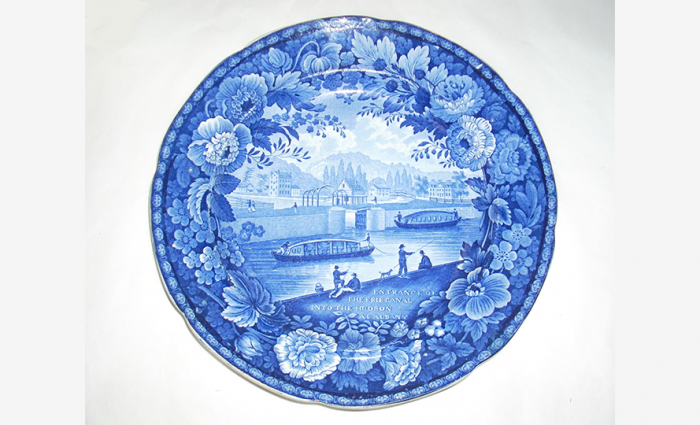 Plates similar to this one were popular in the 1820’s and 1830’s. The drawings on them are typically from an artist named James Eights, who accompanied the Erie Canal engineers in 1825, and documented the completed structures by making little watercolor drawings. The drawings were then used later as imagery for some of the plates, including this one. Entrance of the Erie Canal into the Hudson, 1825, Wood Enoch & Sons, pearl ware transfer print, D: 10.25 in. Fenimore Art Museum, Cooperstown, New York, Museum Purchase, N0009.1996.